Ballotcraft is a fantasy politics game (think fantasy football, but for politics). Play against your friends and win by best predicting what’s going to happen in upcoming elections. Sign up and play here: www.ballotcraft.com. This is part one of our three-part series analyzing Ballotcraft’s market data during the first Democratic Presidential Debate, covering the trends that dominated and how a savvy investor could use them in the future. The biggest winner Tuesday night was without a doubt Vermont Senator Bernie Sanders, who won our undecided voter focus group with a walloping two-thirds majority. However, the night was not entirely smooth sailing for the self-described Democratic Socialist. Though he owned at least a share of the lead for the entire debate, his price was dropping from the start, starting at 53.4 and ending at 40.9. 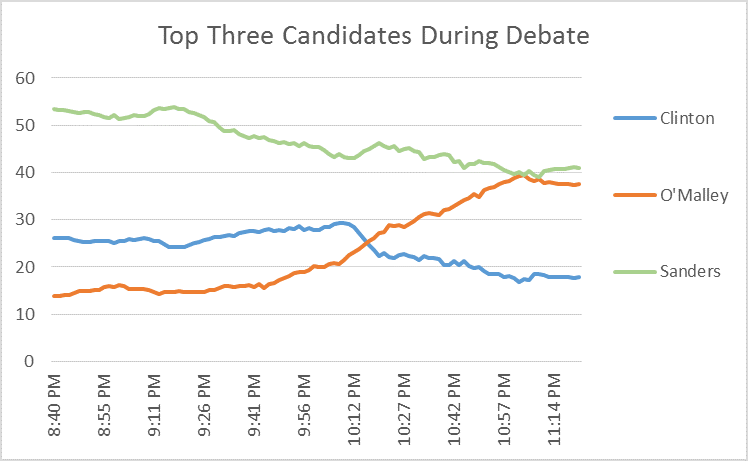 Though his decline wasn’t as rapid as Kasich and Carson’s were during the last Republican debate (and unlike those two Sanders did end the night in the lead and won the final vote), this still showed a concerning amount of weakness for someone who was trading at or above 60 percent for much of the day of the debate. Not surprisingly, Sanders’ most vulnerable moment was during the prolonged discussion of gun control, the rare issue on which Sanders takes a more conservative stance than his competitors. During this discussion and for a short while after, Bernie’s lead began to melt away, his price dropping 7.6 points over a span of 20 minutes, which accounted for over half of his total price change over the night. Not helping matters for the senator was the fact that the gun question was followed very closely by a commercial break, giving the market plenty of time to mull over his weaker answers. 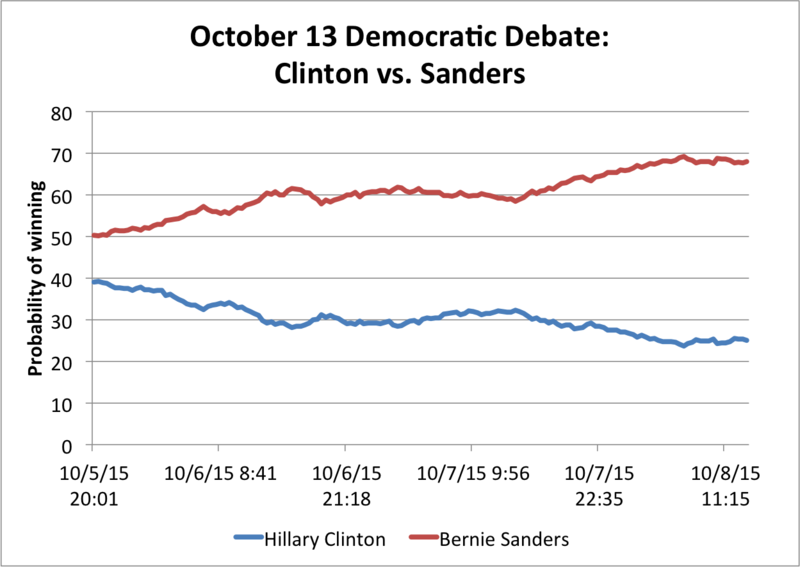 However, Bernie came out of the gates strong after the break, delivering the most memorable line of the debate (I too am tired of hearing about Hillary’s damn emails) and reestablishing some stability for his price, which would only drop another two points during the remaining hour and forty minutes of the debate. One bright note for Sanders on the market was that his price seemed tied only to his performance, cementing his status as frontrunner in the eyes of our traders. When Martin O’Malley made his climb during the back half of the debate, steadily rising 20 points in an hour, Sanders barely felt it, falling only 2.6 points during the same period. Instead, Hillary Clinton took the brunt of the damage, dropping 13.2 points. This means the market viewed Clinton and O’Malley as being more in conflict with each other (to be the mainstream alternative to Sanders) than as direct competitors to Sanders himself. Likewise, as Sanders price fell, the lost points were pretty equally redistributed among his rivals, reaffirming this idea of “Bernie versus the field”. Putting all of this together, we see a pretty rosy picture for Sanders supporters and buyers during upcoming debates. Sanders’ message of a new liberal revolution is as appealing to hear over the airwaves as it is in person at his massive rallies, which is why he can largely avoid interaction with his fellow candidates and decide his own destiny. The only downside of this for buyers is that it may drastically over- or undervalue his actual chance of winning, as it did this week, since he isn’t really being compared to the other debaters, just to our collective expectations of him. Still, barring a transcendent performance from O’Malley or Clinton, I’d say Sanders is the odds on favorite to win next month in Des Moines, so go join a new market and buy big now. I think Bernie won because, despite his pretty heated nature, he was the most consistent, convicted, and level-headed. I thought this made him appear more electable than I previously thought. Bernie did better than expected I think although Hillary was pretty strong too. Jim Webb and Lincoln Chafee should go home. Clinton demonstrated her ability to act as a moderate while still focusing on the priorities of the party base. I was impressed by O’Malley’s approach to the issues as well as the professionalism by which he presented himself. 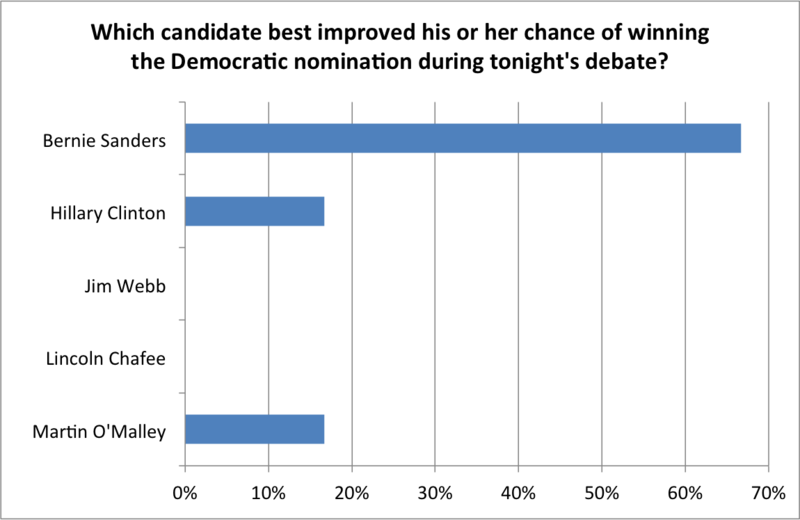 O’Malley came across well, and best improved his chance of winning (it went from extremely improbable to a little more likely than extremely improbable). He came across as credible. 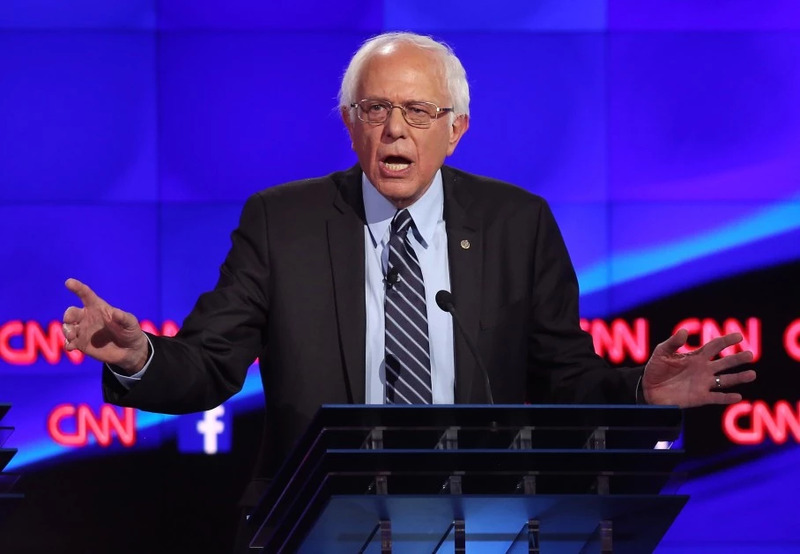 Bernie Sanders clarified his stances that the American people may have been unclear about. Thanks again to our focus group for their help! Bernie Sanders is the winner of the October 13 Democratic Debate, as he was deemed by our focus group as the candidate to have “best improved his or her chance of winning the Democratic nomination”. With the first Democratic Primary debate just one day away, it’s time to start forming your strategy to top your league in Ballotcraft. Thankfully, unlike in the Republican debates, we’re only going to have five candidates on the stage tomorrow night. This means you’ll have fewer candidates with a real chance of winning our focus group’s vote (really only two if we’re being honest), but also fewer opportunities to generate profit during the debate. So instead of focusing on each candidate as we’ve done before, let’s take a look at the factors that might make the difference in Las Vegas between the two frontrunners. An obvious factor in deciding the winner will be what is actually debated in Las Vegas. With so few debates for the Democrats this year, CNN is going to want to cover a lot of ground in a limited amount of time, meaning some crucial issues will either be left out or only barely touched on. Each candidate has their own strengths and weaknesses, and what CNN chooses to ask the candidates will go a long way in painting them in the eyes of undecided voters. For example, if Martin O’Malley seems to be on a roll in the early-goings but the topic of conversation shifts to race relations and the police, his legacy in Maryland may bring his stock back down in a hurry. Buy Clinton If: Conversation shifts to foreign policy, which Hillary can tie to her experience as Secretary of State, or gun control, on which Bernie has a weak record. Buy Sanders If: Debate focuses on tax and Wall Street reform, two of Bernie’s biggest talking points on the campaign trail, or the Trans-Pacific Partnership, a recent subject of scrutiny for Clinton. Another major deciding factor will be whether this inaugural debate is focused more on the primary elections or the general matchups to come. Despite her drop in the primarily polls, Clinton still fares better than Sanders on average in head-to-head polls against Republicans. With Republican voters seriously considering nominating a radical candidate with no government experience, attractiveness to moderate voters will be an important attribute for the Democratic nominee. Then again, one could just as easily argue that energizing the liberal base may be the best way to combat the invigorated conservative crowd. Buy Clinton If: The candidates start competing on who is going to be the best general election candidate. Buy Sanders If: Sanders claims to be the most exciting or liberal candidate, and the crowd backs him up. Of course, there are three candidates at the debate not named Sanders or Clinton, and the way Lincoln Chaffee, Martin O’Malley, and Jim Webb approach the debate will have quite the impact in deciding the eventual winner. Though it would take a miracle for one of these three to win it all, they could easily direct the course of discussion to the strength or weakness of their chosen competitor. If O’Malley is seeking the veep nomination or cabinet post that many believe he is, then expect him to go a little easy on Clinton and maybe even throw her a few compliments. But if he is in it to win it and goes after her, or jumps on Bernie for his far-left ideologies, then there could be some serious ripples in the market. Buy Clinton If: The other candidates are simply trying to prove their worth as running-mates or try to reestablish Democrats as the centrist party. Buy Sanders If: The second-tier candidates make the attacks on Clinton that Bernie has said he won’t or join him in pushing the Democratic Party in a more socialist direction. As we saw in the last CNN debate, the moderators at a debate have an incredible amount of control over how the candidates behave. Besides picking the subject matter to be debated, they can also set the level of tolerance for personal attacks and untruthful claims. Compared to the Fox News debate, in which the moderators were diligent in asking the candidates, especially Trump, follow-up questions, the CNN debate allowed candidates to get away with outrageous claims, which favored the more exciting, hyperbolic candidates. Buy Clinton If: CNN holds candidates as unaccountable for their comments as they did in the Republican debate, letting Clinton skirt by for some of her more striking flip-flops. Buy Sanders If: CNN keeps the conversation on ideology and policy, and run a more structured, traditionally-formatted debate. Finally, we come to the biggest unknown of the night. All of the candidates in the Democratic race have promised or implied that they intend to to keep the campaign focused on themselves and the issues, staying away from attacks on the other candidates, a major difference with the GOP race. However, unlike the highly-covered GOP race, this is the first real chance for the Democratic candidates to go back on that pledge. If the crowd is getting behind Bernie in a major way and Clinton is feeling desperate, she may turn to the more negative tone that marked the end of her ’08 campaign. The question would then be how the audience responds, and whether Sanders returns in kind. Buy Clinton If: Hillary stays above the fray and appears to care more about the issues than the election. If she attacks, buy if Sanders is caught off-guard by it or allows the debate to devolve into something resembling the September GOP debate. Buy Sanders If: Hillary attacks but Sanders stays the course. The more he looks like the elder statesman, the better he’ll do with unconvinced Democrats. Noah Lieberman is the founder of election forecasting website PollingLab. Click here to see more of his analysis of the 2016 election. With six days left before the first Democratic Presidential Debate, trading is starting to heat up on Ballotcraft. And while you’re going to have to be active on Tuesday night to win your league, implementing a strategy now might be enough to get a leg up on the other traders. So with that in mind, here are the big trends we’re seeing on the market and how you can use them to get ahead. For much of the past week, the story on Ballotcraft has been pretty much the same. While the lesser-known Democrats languished in the measly single digits, former Secretary of State Hillary Clinton and Vermont Senator Bernie Sanders duked it out for the top spot. Each candidate took a few turns on top, with Bernie holding the lead for the majority of the past week, until Monday night, when Bernie began pulling away and pulling away fast. Since 8:00 PM Monday Bernie has increased his lead from just over 10 points (leading Clinton 49.5 to 38.8) to 43 (he leads 68.1 to 25.1 at the time of writing for this article). And frankly, I don’t see this trend as being too unreasonable. Bernie draws in bigger crowds than candidates ever have before, purely on his ideas and skill as an orator. Hillary on the other hand has felt wooden and manufactured for most of this campaign, and lost the 2008 race to Obama because she lacked his ability to fire up a crowd. I’m not saying Clinton only has a one in four chance of winning the debate, but I think Bernie is rightfully out in front. Don’t hesitate on Sanders because of the high price, because it looks as though it may only get higher. Before we go back to the Clinton-Sanders competition that will likely take up most of the debate, let’s take a quick look at the other three candidates who will grace the stage on Tuesday. Martin O’Malley was the Governor of Maryland, and his odds currently sit at 2.5%. Jim Webb is a former Virginian Senator, whose odds are at 2.3%. And Lincoln Chafee is the former Governor of Rhode Island, whose odds are hovering around 2.2%. If you’re sensing a trend, you’re not alone. Traders have largely stayed away from these candidates, and not without good reason. They’re all polling abysmally (O’Malley leads the bunch with a resounding 1.0% on the Huffington Post’s Pollster), have done nothing to generate media attention in the last 4 months, and are all incredibly bland, boring speakers, especially compared with the energetic and impassioned Sanders. The one thing I would keep in mind with these three is that the question asked of our focus group is which candidate “best improved their chances” of winning the nomination based on the debate. Since these guys all have a zero percent chance of winning at the moment, it may not take much for them to improve their odds. Still, I highly doubt any of them will come up with a good enough line to bump their price even momentarily during the debate, so stay away unless you’re feeling the need to be risky. Finally, let’s jump back to our frontrunners and consider what events could fuel a Clinton resurgence on the site. For that, we’re going to have to look back to the past week, and see what kept Clinton in the hunt up until Tuesday. Clinton’s best performance of the past week and a half came between Tuesday and Friday, when, coincidentally, the news was focused on comments made by House Majority Leader Kevin McCarthy. These comments supported a long-held Democratic belief that the House Select Committee on Benghazi was just a way to defame Hillary Clinton, and temporarily had the media focusing on the “Hillary vs. the GOP” storyline which has dominated much of the past two years. Now it’s probably not enough evidence to conclusively say Hillary’s five point rise over this time was due to the renewed focus on her general election prospects, but I think that may be a fair assumption. Her price rose without Sanders’ going down, indicating the rise was motivated entirely by faith in her chances, rather than lack of faith in his. If talk on the Sunday shows this week, and certainly if talk in the debate, turns to the general election, expect Hillary to look a bit more competitive on the site.